Sorry about your Mum. Hope someone recognises this for you. 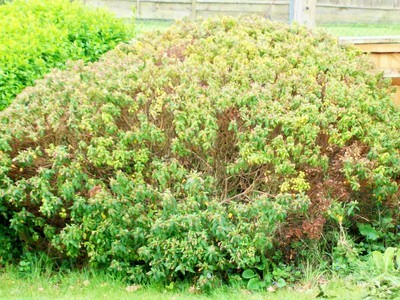 Trimming shrubs is usually best after flowering, by autumn at latest. it looks like a very big potentilla or a helianthamum. google their images and see if it is and then look up cultivation tips for the plant. Is it not an overgrown Cistus Ladanifer or Cistus Eucalyptus, can't see the leaves clear enough but that is what I would go for, Look that up on the webb they will give you close ups I am sure that you can compare. thanks, will have alook on google, when it flowers i will put picture up, hopefully clearer than this one.